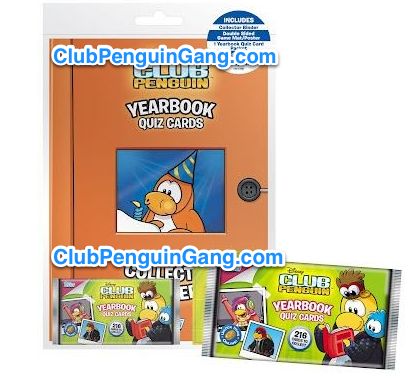 Club Penguin Cheats by Mimo777 Club Penguin Cheats by Mimo777: Club Penguin New Yearbook Quiz Card Game! Club Penguin will soon release the new Yearbook Quiz Cards. Each set of cards has 1 code to unlock items! Whoa whoa whoa..... Whoa! Let's zoom in a little here. That's better! Take a look at this penguin's hat. 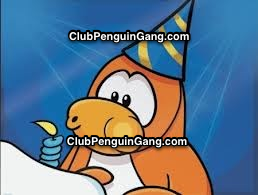 Do you think this is going to be the 7th Anniversary Party hat for this year!? Blue and gold. I kinda like it. You? What do you think of this new quiz card thing? NO, it is NOT Rockhopper the penguins built it for a party earlier on this year what part of that do u not understand?